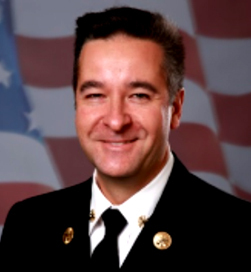 Deputy Chief Phillip T. Fligiel is a 25-year veteran of the Los Angeles Fire Department (LAFD) with years of experience shaping the operational direction of the organization. Chief Fligiel has served the citizens of Los Angeles in the promotional ranks of Engineer, Fire Captain, and Battalion Chief.He is also a State and Los Angeles County Certified Paramedic. The Chief’s top four priorities in the Central Bureau include providing exceptional public safety and emergency services; building and maintaining valuable relationships with residents and civic groups; improving internal communications and accountability for efficiency for both fire members and the community; and ensuring the Bureau’s superior operational performance. Chief Fligiel has spent the last decade of his career serving the citizens in the central area of Los Angeles. In addition to first responder services, Chief Fligiel provides tactical and operational leadership in multi-agency, multi-jurisdictional public safety planning, and response for significant events and incidents within the City. Chief Fligiel is a qualified California Incident Command Certification System (CICCS) Type I Planning Section Chief. He has served the State of California as a member of CAL FIRE Incident Management Team 1 and has assisted with the mitigation of several significant wildfires throughout the state. Chief Fligiel is a Los Angeles native and grew-up in the San Fernando Valley. He has earned a BS degree in Emergency Services Management, a certificate in Fire administration, and holds a variety of other certifications focusing on leadership and emergency incident management. As the Central Bureau Commander, Chief Fligiel manages the day-to-day operations of 22 fire stations and 645 personnel.